Earlier this summer I had shared an article that I had written on Summer Vacations and International Child Abduction Warning Signs. The article explained in detail some of the possible scenarios and techniques that a potential abductor may use in order to wrongfully remove a child from their home country of jurisdiction. Even though that article was focused on the time of summer vacations, a time where approximately 85% to 95% of all parental abductions occur in the United States or abroad, even though summer is almost over international parental child abduction still poses a very serious threat for many families. As always, the I CARE Foundation works toward the goal of preventing international child abductions. One of the major keys to protecting innocent children from abduction is raising awareness of the realities of international abduction with the hope that our messages about the risks and warning signs that a kidnapping is being planned may allow a parent or other stakeholders the opportunity to prevent abduction. Historically, the U.S. rate of reported cases of outbound abduction has declined by approximately 15% during the fiscal years 2011 and 2012, and that is after nearly 30 years of reported growth. This tells us that abduction prevention efforts are working. 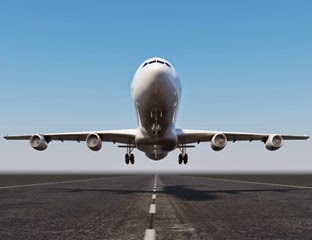 Now one of the most concerning risk factors that will lead to international child abduction is the use of a would-be taking parent to use a secondary passport not issued by the United States government in order to depart the country as shared in detail in the article published on behalf of the I CARE Foundation titled Summer Vacation. Child Abduction. Dual Citizenship. Two Passports. How To Prevent Abduction. I urge any parent who believes they are at risk of abduction to read both articles that I have listed. One of the most effective tools available for at-risk parents trying to prevent abduction is the Prevent Departure Program, which is a secure screening program that lists any individual considered by the courts or law enforcement to be a high-risk child abductor. In order to be placed on the Prevent Departure Program, there are certain requirements, one of which presently includes that the person cannot be a citizen of the United States of America. Thus, only aliens residents (or non-residents) physically located in the United States may be put on the Prevent Departure Program at the request of the Department of State to the Department of Homeland Security. Unfortunately, the caveat is that in order for a person to be considered a candidate for the Prevent Departure Program they are not American citizens, which presents a problem since individuals who possess dual citizenship, including American citizenship, cannot be placed on the Prevent Departure Program list. Hopefully, there will be a modification in policy so that American citizens who are considered to be high-risk child abductors can be placed on a secure screening list. 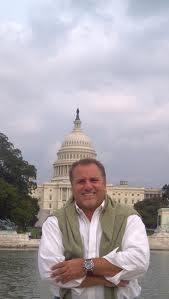 The following press release provides details of the need to have the Prevent Departure Program policy modified: Peter Thomas Senese & The CARE Foundation Supports GAO Recommendation to Create Departure Screening List for High-Risk U.S. Citizens Considered High-Risk Child Abductors. So what is the Prevent Departure Program and how can it be applied? There must be some likelihood that the Subject will attempt to depart in the immediate future. For more information on the ‘Prevent Departure Program’, please visit the U.S. Department of State’s website or contact the Office of Children’s Issues. Finally, the Department of State's Office Of Children's Issues Abduction Prevention Division is in charge of requesting that an individual be considered a candidate to be listed on the Prevent Departure Program. From our experience, it is critically important that a court order be issued stating that a specific person be listed on the Prevent Departure Program, and that person is restrained from traveling outside of the United States with the specified children of the partnership considered by the court to be at risk of possible abduction. 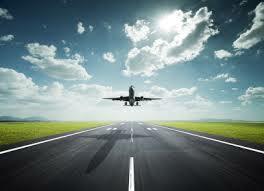 For more information on international parental child abduction please visit the I CARE Foundation. Some of you may be interested in also visiting the official website of my deeply inspired novel about abduction titled CHASING THE CYCLONE, which contains a great amount of information on abduction. On behalf of the I CARE Foundation I had written an article titled, Summer Vacations and International Child Abduction Warning Signs. In this article I had listed some detailed scenarios with regards to some techniques that would-be abductors may use in order to wrongfully remove a child from their home country of jurisdiction. It is estimated that nearly 85% to 95% of all parental abductions in the United States or abroad occur during the school summer vacation and although summer vacations have come to an end for many children as they are returning back to school, international parental child abduction still poses a grave risk for many families. The I CARE Foundation is always working toward the goal of preventing international abductions. One of the keys to protecting children from abduction is raising awareness of the realities of international abduction with the hope that our messages about the risks and warning signs that a kidnapping is being planned may allow a parent or other stakeholders the opportunity to prevent abduction. Historically, the U.S. rate of reported cases of outbound abduction has declined by approximately 15% during the fiscal years 2011 and 2012, and that is after nearly 30 years of reported growth. This tells us that abduction prevention efforts are working. Best-selling author Peter Thomas Senese continues to show his dedication for assisting families that are targeted for international abduction by supporting the I CARE Foundation. 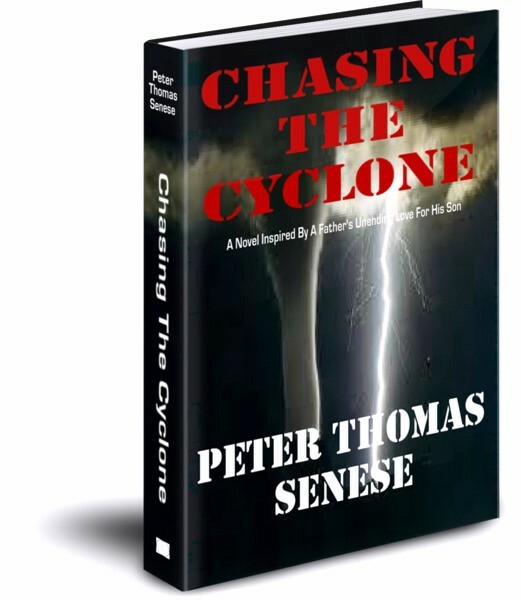 Peter Thomas Senese has stated that he is truly honored being able to help these families by donating 100% of his e-book royalties earned from the sale of Chasing The Cyclone. The I CARE Foundation, an organization dedicated to conducting research and raising social awareness about the serious issue of international child abduction, has also played a major role in creating legislative initiatives that are helping to reduce the rate of abduction. The critically-acclaimed Chasing The Cyclone has been heralded as a must-read book by targeted parents that are desperately trying to protect their children from international child abduction. Peter Thomas Senese's novel has been recognized by numerous child abduction prevention advocates around the world, as a road map on how a parent may either prevent the international abduction of their child or reunite with their child. As international parental child abduction continues to be a grave concern for thousands of parents each year, resource guides that outline child abduction risk factors and preventive measures against abduction are critically important. Chasing The Cyclone provides parents with keen insight on such issues. Numerous top book critics and readers alike are hailing Chasing The Cyclone as a fast-paced suspense thriller wrapped within the ultimate love story between a father and his son. Peter Thomas Senese's novel is one that perhaps few other writers could have written with such intimacy, familiarity and depth of understanding. It is a story of a father doing everything possible to find and reunite with his inernationally abducted child. Chasing The Cyclone is inspired by the best-selling author's own harrowing experience of racing into the dark and dangerous storms of having a child internationally abducted to the other side of the world, and a father's willingness to stop everything in his life to fight incredible odds to find and reunite with him. Peter Thomas Senese commented, "Chasing The Cyclone is the story of the greatest type of love of all: the love and commitment a parent holds for their child. Imagine having a complete life, filled with all the niceties you can imagine, when suddenly your defenseless child is used in the most unthinkable of schemes intended to cause you great hurt, and is criminally abducted to some unknown place on the other side of the world. Now imagine that the only thing that stands between bringing your child home or having your child lost forever, is you and your willingness to face the ultimate sacrifice. Well, that is what happens when a parent finds themselves "Chasing the Cyclone" of international child abduction." He adds "When I was 'Chasing the Cyclone' of child abduction, I made a promise to my God that one day I would come back to this fight, and make a difference for other children and their parents. In donating my royalties to the I CARE Foundation, we were able to help reunite children who were criminally abducted with their families. 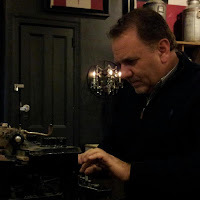 So in this sense, I suppose, readers of my novels have a direct and measurable way to participate in helping children." The New York Journal of Books had this to say about Chasing The Cyclone: "Chasing The Cyclone is a well-written thriller . . . Senese shares myriad emotions by writing in the first-person as he weaves through the action in this suspense-filled story . . . This novel might also be considered a treatise on international child abduction. Cyclone, while full of actual strategies and resources to assist parents in international abductions, is above all else a love story about a father and son ... From Los Angeles, to Canada, to New Zealand, and eventually, Macau, a special administrative region of China, Cyclone is rife with international intrigue and suspense. The protagonist, Paul Francesco, orchestrates a master plan that he hopes will reunite him with the love of his life - his son. Along the way he finds himself swamped in red tape and drenched in frustration. Filled with a plethora of powerful characters and puzzling predicaments and dead ends, the story moves quickly . . . Cyclone will leave you informed and satisfied . . . you will be reluctant to put down." Amazon Hall of Fame reviewer Daniel Jolley commented, "Chasing The Cyclone isn't just a powerful novel; it's a call to arms against a growing epidemic that is tearing lives apart behind the headlines... Chasing The Cyclone is much more than just a superb, can't-put-down novel, though; it is a book with a purpose... Thomas has become an outspoken advocate on this issue, and Chasing The Cyclone makes for a clear and profoundly effective call to action. I would go so far as to encourage every loving parent to read this book, as the bond between this father and son is one to be emulated..."
The I CARE Foundation announced today about the creation of a Special Commission that will steward the global implementation of the recently released 'International Travel Child Consent Form' and report back to the leadership of the Hague Conference on how effective the new abduction prevention tool was in stopping international child kidnappings based upon the wrongful retention of a child abroad established under the Hague Convention on the Civil Aspects Of International Child Abduction. The I CARE Foundation's Special Commission will consist of highly knowledgeable child abduction prevention advocate stakeholders in Hague-signatory member states, including attorneys, judges, law enforcement officers, and policy administrators. The focus and responsibility of the Special Commission is to steward the existence and implementation of the I CARE Foundation's travel consent form around the world that is steep in Hague-oriented language and case law in an effort to prevent abduction. In addition, the Special Commission will share its findings with the Hague Conference on International Private Law, with the goal that the Hague leadership will implement a universal policy similar to what has originated in the non-government organization sector. Conceptually created at an I CARE Foundation conference held at the United Nations attended by Turkey's Honorable Judge Selma Nilhan Tekinalp, a world renown child advocate and leading authority on Hague abduction law as part of the International Visitor Leadership Program, the I CARE Foundation's International Travel Child Consent Form' has significant support in courtrooms around the world as demonstrated by Judge Tekinalp's perspective. "The judiciary has an absolute responsibility to prevent against international parental child abduction. In cases when a parent wrongfully takes or detains a child in a foreign country without court order or consent society must understand that this is never a child custody case but a case of kidnapping. The grave and severe abuse to children of abduction at the hands of their kidnapping parents is devastating and only now coming into public light. From the I CARE Foundation sponsored conference at the United Nations I participated in, and discussed with Mr. Peter Thomas Senese numerous issues revolving around how we may prevent abduction, I am pleased to share that the 'I CARE Foundation's International Travel Child Consent Form' has the worldwide potential to dramatically reduce global child abduction. This agreement is deep in Hague law, and strikes at the core of abductor statements who may attempt to mislead courts into sanctioning a kidnapping established under the rules of the Hague Convention. I welcome the creation of the Special Commission." Mr. James Westman, formally a high-ranking senior officer with Canada's Royal Canadian Mounted Police with an extensive investigatory background in national intelligence, counter-intelligence, and child abduction and trafficking and who's dedication to protecting innocent children from abduction is at the very core of the I CARE Foundation's initiatives added, "The creation of the Special Commission that will report the findings and implementation of the International Travel Child Consent Form will hopefully convey the importance of having a Hague-centric platform for children traveling abroad. As a senior federal law enfacement officer, and then later, in my work in the private sector dealing with child abduction, it is clear the vast majority of abusive international parental child abductions occur due to the wrongful retention of a child. What is unique about our I CARE Foundation doctrine is that it cuts to the chase of wrongful retention legal matters created under the rules of the Hague Convention. This new tool, once shared and implemented worldwide very well could become the singular most important international child abduction prevention tool operating on a global scale ever created. I expect that when the Special Commission shares our findings with the leadership of the Hague Conference, our findings will show a significant reduction in abduction cases related to international travel, and, there very well should be a drastic reduction in time targeted parents spend attempting to reunite with their abducted children." Peter Senese, the Founding Director of the I CARE Foundation added, "It is deeply rewarding to know that from all appearances and initial data, the 'International Travel Child Consent Form' will have a dramatic and significant impact on preventing international child abductions around the world. In a short time, the doctrine not only has been embraced and utilized by a large number of families around the world, but not one child who traveled internationally under this consent form has been wrongfully detained thus far. Naturally the summer is still on us; however, so far, the data is very encouraging. I look forward to partaking in the Special Commission's study and reporting our findings with the Secretary General." Silvia A. Sejas Pardo, a highly respected Argentinean and Spanish international lawyer based in Spain and who is a Founding Member of FASIM, an international association of attorneys dedicated to preventing child abduction commented, "The creation of the Special Commission is a critical step in furthering the global utilization of the 'International Travel Child Consent Form' into courts everywhere. We as lawyers who are on the front-line in the fight to stop abduction not only must embrace this clever and sophisticated tool, but we must share of its high merit with lawyers and the judiciary around the world. If we do, we will prevent many abductions." Carolina Marín Pedreño is a partner at the prestigious London-based law firm of Dawson Cornwell, Carolina Marín Pedreño is the Founding Member of FASIM, an international association of attorneys based in Barcelona created to prevent and assist with international child abduction cases. Additionally, Carolina is the Secretary of the British and Spanish Law Association, a member of the Spanish Association of Family Lawyers, AEAFA, Resolution, Reunite: International Child Abduction Centre, the Society of British and Argentine Lawyers, and the Association of Lawyers for Children, added, "The positive feedback of the Secretary General is extremely welcome as it highlights the potential of the I CARE Foundation's 'International Travel Child Consent Form as an international instrument to prevent and reduce cases of child abduction globally. The I Care Foundation has created a wonderful tool, but it is essential that the judiciary and child abduction practitioners around the world now use the Consent Form in international cases; only then will a body of case law develop in each jurisdiction that will enshrine the importance of the Form and lead to a significant decrease in international child abduction. I welcome the creation of the Special Commission and look forward to sharing our findings with the Hague Conference's leadership." Mexico's Carlos Alvarado is a partner at the International Law Group and considered one of the most knowledgeable international family law attorneys in Mexico. Mr. Alvarado was responsible for codifying and translating the I CARE Foundation's travel consent form into Spanish. Mr. Alvarado added, "The creation of the I CARE Foundation Special Commission is a very significant event for it further demonstrates the significant progress of the 'International Travel Child Consent Form'. There is no question in my mind that when fully implemented, we will see a sizable decline in child abductions. On this note, society must remember that when a parent internationally abducts a child, this is not a child custody case, but a kidnapping. And as reported last month by the U.S. Department of Justice, children who are abducted by one parent face high degree threats of violence and possible murder. I look forward to sharing the findings of the Special Commission with the leadership of the international community." Jennifer Cluff, considered one of the world's top parent blog writers and who is responsible for the I CARE Foundation's social media outreach added, "Over the course of two years since my involvement with the I CARE Foundation, it still shocks me to realize just how big of a pandemic international parental child abduction is. However, I know first-hand the outreach efforts of our I CARE Foundation family to raise awareness of abduction so that kidnappings may be prevented has a large and measurable impact on stopping kidnappings. As a mother and child advocate, the creation of the Special Commission in order to further share light of the I CARE Foundation's findings could once again protect a large number of children around the world." Elisabeth Hirsch, a highly respected human rights activist and child advocate who has assisted the I CARE Foundation in global outreach stated, "The creation of a Special Commission to formally value the contribution of the I CARE Foundation's Travel Consent Form' is a critical step in preventing these terrible kidnappings. It is critical that society continue to create abduction prevention tools in order to protect innocent children." 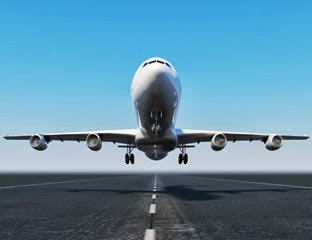 Family law attorneys worldwide are calling The I CARE Foundation’s groundbreaking International Travel Child Consent Form as a groundbreaking universal child abduction prevention tool that can be used to protect children at risk of international parental abduction. The I CARE Foundation’s International Travel Child Consent Form is being viewed by highly respected international family law attorneys around the world who are deeply familiar with the grave challenges of international parental child abduction prevention and reunification as a significant new tool that may assist them and courts protect against abduction. Worldwide, international parental child abduction increases substantially during the summer months when children are on summer school break. One of the primary methods behind these abductions under the rules established by the Hague Convention on the Civil Aspects of International Child Abduction occurs when a parent wrongfully detains a child in a foreign country outside of a court order or without consent of the other parent after the ‘taking parent’ is initially granted permission to travel with the child to a foreign country. In many of these cases the ‘taking parent’ carefully conspires to mislead and defraud the courts and the ‘targeted parent’ of their true intent: to relocate in their country of origin with the child while removing the targeted parent's contact with their child. Detecting abduction schemes is often not easy. In fact, some parents conceal their true intent to abduct by inviting the child's other parent to travel abroad with them in an attempt to avoid suspicion of abduction. However, once in a foreign country (often the conspiring parent's country of origin), the conspiring parent unleashes a horrible scheme intended to remove the other parent’s rights to the child. They often succeed. The I CARE Foundation’s comprehensive 'International Travel Child Consent Form' was created to prevent these types of international parental child abduction schemes by calling for both parties to affirm key components central to the ability for an abductor to mount a false and misleading legal defense while also creating additional affirmations for an expeditious return of a child who has been wrongfully detained. Steep in Hague-oriented case law with focus on Articles 1, 12, 13 and 20, the I CARE Foundation's International Travel Child Consent Form was created to remove a parent's legal defenses under Articles 12, 13, and 20 of the Hague Convention who may be scheming to abduct a child prior to an alleged 'family vacation' abroad while also establishing strong support for a child’s immediate return under Article 1 of the Hague Convention. Silvia A. Sejas Pardo, a highly respected Argentinean and Spanish international lawyer based in Spain and who is a Founding Member of FASIM, an international association of attorneys dedicated to preventing child abduction commented, "We need to continue to treat child abduction and prevention of kidnapping as something extremely exceptional as we are dealing with children's lives. The uncertainty and abuse related to abduction is not in their interest. The I CARE Foundation's International Travel Child Consent Form is workable and would make child abduction more difficult as this document is a legally strong piece of evidence that may result in protecting many children. I hope all Hague-member states embrace this initiative." Peter Thomas Senese of the I CARE Foundation and author of the critically acclaimed Chasing The Cyclone and lead creator of the consent form added, "The new abduction prevention tool was created to help provide clarity and directional paths for any court or law enforcement agency overseeing international parental child abduction associated with the wrongful retention of a child abroad. As the new international travel consent form reaches into Central Authorities and courtrooms around the world, and as attorneys dedicated to protecting children implement this tool or one similar to what the I CARE Foundation has created, we hope that there is a dramatic decline in abusive child abductions. We may not have created a new law, but we have created a universal child abduction prevention tool the entire world can use." Mexico’s Carlos Alvarado, a renowned international family lawyer specializing in international parental child abduction prevention and reunification issues, and who is actively involved in new legislation initiatives in Mexico focused on protecting children of abduction added, "As a law practitioner deeply familiar with Hague Convention law and the great challenges parents and lawyers have protecting children targeted for international abduction, it is critical that new and creative abduction prevention tools are utilized to protect children. The I CARE Foundation's International Travel Child Consent Form is an important tool that can and should be used to prevent children from being wrongfully detained in a foreign country. We intend to widely implement this new tool to protect children in Mexico and whenever possible, assist parents who have had a child abducted to Mexico who have utilized this agreement. This is a tool all attorneys should use." Adding further insight, renown Florida family law attorney Denise Gunn, who is a member of the U.S. Department of State’s Hague Convention Attorney Network and who recently prevented the abduction of two minors from Florida to a non-Hague Middle Eastern country in a complex custody dispute added, “New and applicable international child abduction prevention resources such as the I CARE Foundation's International Travel Child Consent form is a critically needed tool to stop the abusive criminal act of parental abduction. Once implemented, the foundation's groundbreaking Hague Convention-oriented travel consent form should protect a large population of at-risk children around the world who are targeted for wrongful retention under the rules of local and international law. The ingenuity and thoughtful creation of this agreement illustrates the expertise and commitment of the I CARE Foundation to protect children." Linda Hammerschmid is Secretary of the Family Law Association of Quebec and a Family Law practitioner in Montreal Canada with over 30 years’ experience in the field. Ms. Hammerschmid commented, “The creation of the new International Travel Consent form is a MUST have, not only for Government Departments, Family Law Attorneys and divorcing couples, but also for INTACT families, and should be kept at the homes of ALL parents to use whenever one or the other wishes to travel alone with their children. Far too often the traveling parent only informs the other, AFTER departure, of their intention not to return the children.” The I CARE Foundation is a non-profit organization dedicated to preventing child abduction. 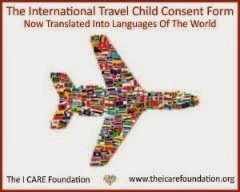 To download a copy of the 'International Travel Child Consent Form' in English or Spanish please visit the I CARE Foundation's official website. For more information about suggestions on how to implement the form and to obtain the legal analysis used to create this abduction prevention tool, please contact by email: legal@stopchildabduction.org or call 310.882.3967. *NOTE: The press news release does not constitute legal advice. Should you require assistance please consult with a qualified attorney. Peter Senese of the I CARE Foundation and author of the critically acclaimed Chasing The Cyclone and lead creator of the consent form added, "The new abduction prevention tool was created to help provide clarity and directional paths for any court or law enforcement agency overseeing international parental child abduction associated with the wrongful retention of a child abroad. As the new international travel consent form reaches into Central Authorities and courtrooms around the world, and as attorneys dedicated to protecting children implement this tool or one similar to what the I CARE Foundation has created, we hope that there is a dramatic decline in abusive child abductions. We may not have created a new law, but we have created a universal child abduction prevention tool the entire world can use."